One of the things that distinguishes Christmas as a holiday is the sheer volume of pop culture related to it that debuts every year. Music is the obvious example: Chances are you can easily name dozens of Christmas songs but not one, say, Labor Day song. Similarly, there is no shortage of Christmas movies, with the Hallmark Channel alone pumping out six or seven new ones every 12 minutes. Christmas movies, when done right, are a very special thing because they evoke a sense of warmth and hominess that reflects the ideal of what the Christmas season should be, to the point that certain movies become traditions themselves, as inextricable a part of the Christmas ritual as opening presents or drinking eggnog or caroling or disappointing your parents. But despite the magical feeling that can come from watching a classic Christmas movie, the fact is that the only real magic at play is movie magic. And sometimes pulling back the curtain on that magic — with, say, set photos — can change the way you look at a movie forever. Here are some set photos from among the most memorable holiday films of all time, hopefully not ruining your childhood, but maybe changing your perspective on it. Elf is one of the most beloved of the modern Christmas movies, an instant classic from its debut in 2003 thanks to its mix of fresh, absurdist humor with a classic holiday aesthetic in its costuming, its Rankin/Bass-style stop-motion animation, and its classy soundtrack, as well as its earnest and guileless philosophy that shows that love and joy can stomp out even the most deeply embedded cynicism. 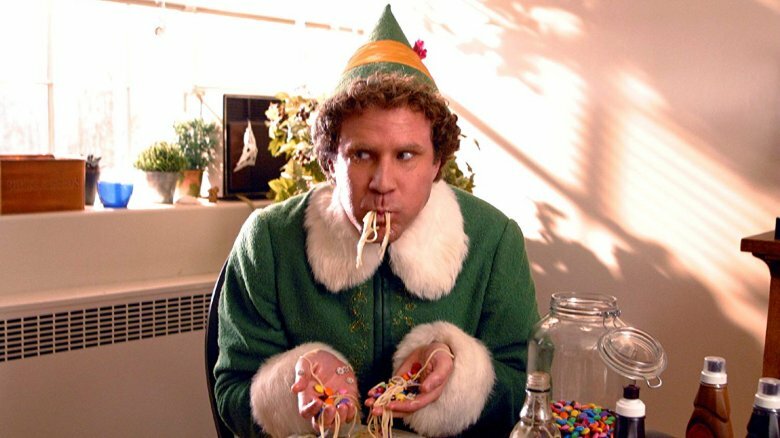 One of the most common special effects in the movie is the type in which Buddy the Elf (actually a human), played by Will Ferrell, is made to look considerably taller than the actual elves at the North Pole. While it might be easy to assume that the filmmakers just shrunk or grew people as necessary with CGI, it turns out CGI is pretty expensive and the right amount of lateral thinking can lead to super clever practical effects, like the one in the photo above. The picture, which shows director Jon Favreau on the far right, displays one bit of camera trickery used to give the impression that Buddy is about twice as tall as his elfin co-workers. 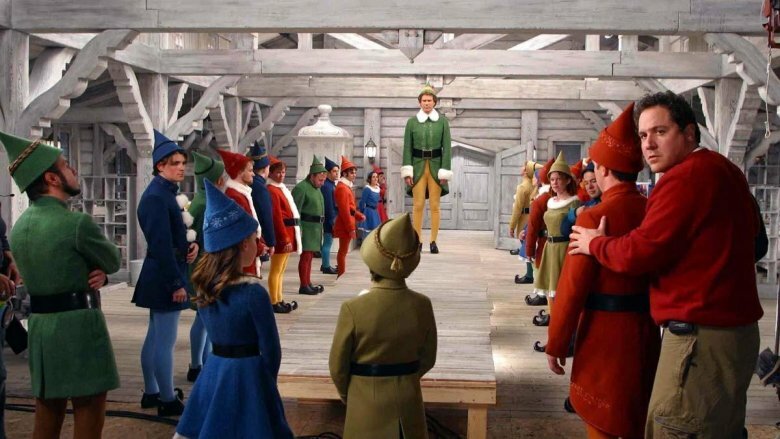 Ferrell stands on a platform that raises him above the elves by a few feet. Viewed from head on, the grain on the platform makes it disappear into the floor below. Combined with some forced perspective, the result is that Ferrell seems to tower over the others, and all without the cost of computer graphics. The uncanny valley is an aesthetic theory that states that a human being's emotional response to a humanoid object like a robot or a doll or an animated character grows more positive as the object becomes more human-like, up until a point at which it becomes almost-but-not-quite human and the response takes a sharp dive (the valley) into revulsion and creepiness (that's the "uncanny" part). Completely unrelatedly, 2004's The Polar Express is a computer-animated adaptation of a 1985 children's book of the same name about a train that goes to Santa Claus' house. The film was directed by Robert Zemeckis, also known for Back to the Future, Who Framed Roger Rabbit, Forrest Gump, and lots of other very popular movies, and stars Tom Hanks, who you have definitely heard of, in a variety of roles, including the train's conductor and Santa Claus himself. How is that that Hanks could play like five or six roles in this movie? Lots of makeup and trick photography? Nah. 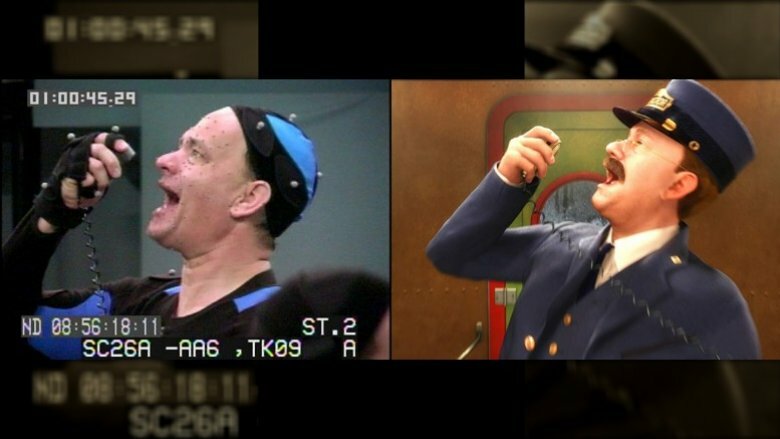 The movie was computer animated with the human performances caught by motion capture, meaning Hanks didn't have to change makeup and costumes, he just had to glue a bunch of little dots to his face, as seen above. The worst part about this particular behind-the-scenes photo is that it shows that they could have just put the dot-covered, black-and-blue-onesie-wearing Hanks on the screen and it would have been way less terrifying than what actually made it to theaters. You know that thing where you ask your parents or grandparents for a thing for Christmas and they get it almost but not quite right? Like you ask for Transformers and get Go-Bots? It's the phenomenon that the studio that made Chop Kick Panda completely relied on. Well, sometimes, all you want for Christmas is your two front teeth, and even when your dad is Santa Claus, he can't quite get it right. 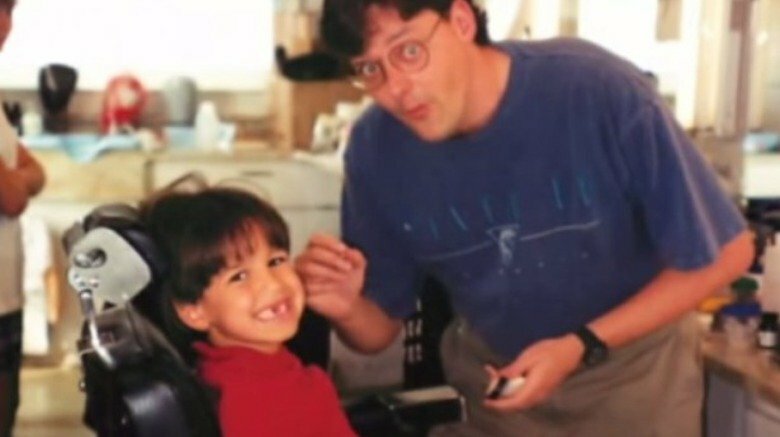 Eric Lloyd was the child actor who played Charlie, the son of Tim Allen's Scott Calvin, the embittered divorcee who murders Saint Nick and assumes his identity in the beloved children's horror film The Santa Clause. It turns out one thing in the movie was faker than the morphing effects when Scott sees himself turn into Santa in the mirror: Lloyd's teeth. As he told ABC News, the young Lloyd knocked out his front teeth at a baseball game, which caused some reshuffling of scenes by crew members very concerned about tooth continuity within their film. In addition to that, Lloyd's bottom teeth were also missing due to having fallen out, and so basically all the teeth you see in Charlie's mouth are "flippers," false teeth that can be applied to a wire within the mouth. The above photo shows the young, toothless Lloyd smiling to hide the pain that comes from not being able to say "sister Susie sitting on a thistle," to whistle, or even to with you merry Chrithmath. Thanks to such TV specials as 1964's Rudolph the Red-Nosed Reindeer, 1970's Santa Claus Is Comin' to Town, and 1974's The Year Without a Santa Claus, very few visual aesthetics evoke the feeling of Christmas like the stop-motion style of the holiday specials produced by Rankin/Bass Productions known as "Animagic." That's why Elf and Community both used that specific style to give their own works that classic Christmas feel. Rankin/Bass, however, didn't produce their animations in-house. All of their stop-motion and cel-animated specials (like Frosty the Snowman) were outsourced to Japanese studios, including Toei Animation, who would go on to produce such series as One Piece, Dragon Ball, and Sailor Moon. Rudolph, however, was created by Tokyo's MOM Production, led by Tadahito Mochinaga. 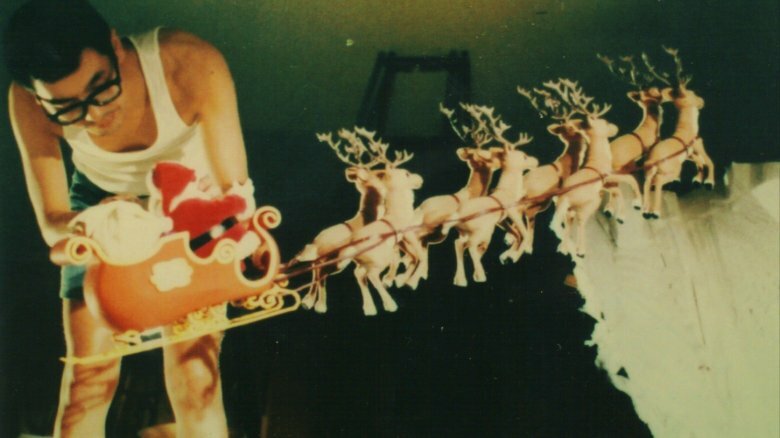 As seen in the set photo above, the film was created with dozens of puppet figures about 8 inches in height each, which means that that's actually a normal sized Japanese man positioning Santa in his sleigh, not a Godzilla-sized human trying to steal Christmas (the animator in question here is Hiroshi Tabata, who also worked on Santa Claus Is Comin' to Town and Rudolph and Frosty's Christmas in July). The fact that he's in a tank top and shorts is a stark reminder of how hot the lights in the studio must have been, which kind of crushes the wintery, North Pole mood evoked by the puppets, even if Rankin/Bass productions are renowned for their powdery snow aesthetic. So, here's a weird thing: It turns out the Muppets are puppets, actually? Okay, so, hearing the words "Muppets" and "puppets" back to back, it is, in actuality, pretty obvious, but it's sometimes easy to forget thanks to the life imbued into the performances of these characters by the uniquely talented Muppet Studio puppeteers, even when the regular cast of Muppet characters are themselves playing other iconic characters. Such was the case in 1992's The Muppet Christmas Carol, which it turns out was based on *checks notes* Charles Dickens' A Christmas Carol, the 1843 novella that still proves that Christmas is the right time for ghost stories. 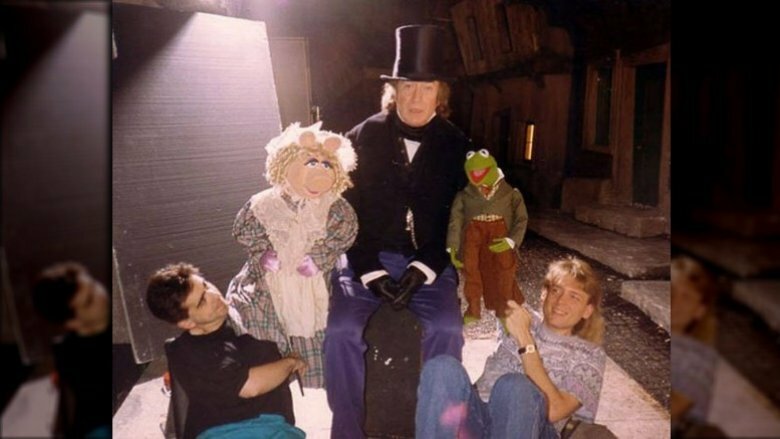 In the classic Muppet adaptation, the main cast of Kermit and Piggy and Fozzie and so on are placed in the roles of Dickens' characters — or in Gonzo's case, Dickens himself — and transported to Victorian England to interact with an all-too-human Ebenezer Scrooge, played delightfully by Michael Caine. Between the impeccable art direction and costume design (not to mention the rad new puppets for the various Christmas ghosts), it's very easy to get transported in your mind to the 19th century for a classic Christmas full of, like, wassail and figgy puddings and what have you. Until you see this set photo. Steve Whitmire (who was Kermit from 1990 to 2016) has a truly epic mullet and … whatever that shirt is that bring you crashing back to Earth, 1992 A.D. Michael Caine seems pretty disoriented by the chronal dissonance himself. Despite the fact that it's a mischievous little kid-friendly(ish) horror flick about a teen and his very cute and marketable good monster fighting a horde of more sinister, grosser monsters, Gremlins has Christmas baked into its very DNA. Gizmo, the original mogwai from whom the other, eviller gremlins are ultimately spawned, is a Christmas gift to the main character, Billy, from his dad. Also there's that whole scene where Billy's girlfriend tells him about how her dad died in a chimney while dressed as Santa Claus, remember? You might have tried to repress that memory, but it's definitely there. 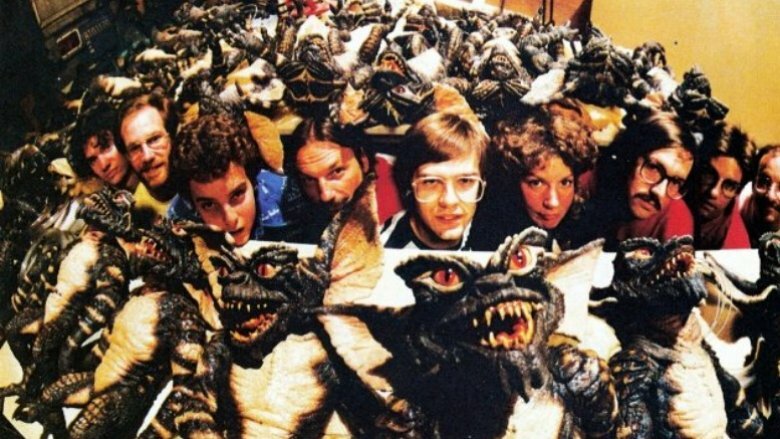 When the mogwai eat after midnight (which, by the way, is literally every time of day), they transform into the titular gremlins and they immediately make no end of trouble, trying to murder Billy's mother and also being a very rambunctious audience at a screening of Snow White and the Seven Dwarfs, actions which the movie treats as roughly equally bad. At any rate, they're constantly making trouble, breaking things and hurting people for giggles. And so it's almost a little disconcerting to see them in this set photo, in which they're just lifeless puppets, lying there around their puppeteers. Just chilling on little wooden shelves, like props do, except with sinister, toothy grins molded onto their faces. It's enough to make you want to warn the humans in the photo that Stripe and the gang might be planning something. Is there a more iconic Christmas movie than It's a Wonderful Life? You might be saying an answer other than "no," right now, but you know you're lying to yourself. George Bailey and Clarence and Mister Potter and Zuzu's petals and Buffalo Gals and Bert and Ernie and Bedford Falls and the movie house and the Emporium and the wonderful old Building and Loan? Can't beat it with a stick, to be honest. And "honest" is the word. Despite being the admittedly sentimental kind of material known back in the day as "Capra corn" (after the director, Frank Capra), there's something that feels real about the emotional lives of these characters and their hopes and dreams, an authentic-feeling (if imaginary) Americana like the magazine covers of Norman Rockwell. It feels like real people, it feels like 1940s America, and, darn it, it feels like Christmas. But while the emotions may be real, the Christmas, alas, is fake. In this collection of set photos from Time, many of the photos reveal that the white Christmas in Bedford Falls is just Hollywood trickery. 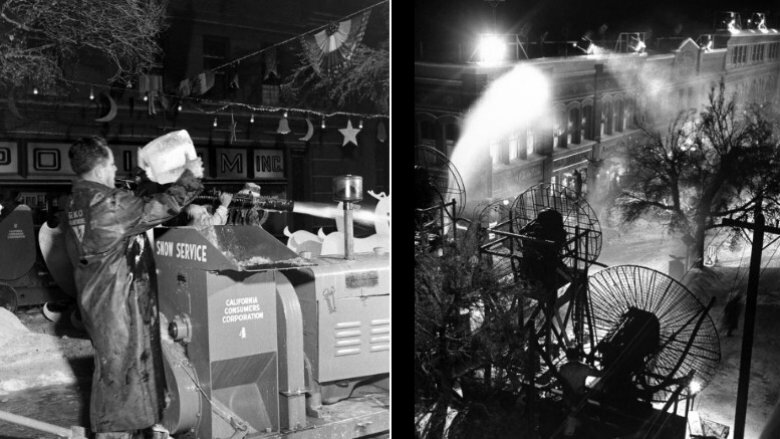 Apparently the "California Consumers Corporation" (which absolutely sounds like a business owned by Mr. Potter) provided a "snow service" in which fake snow was shot out of long black hoses and then blown all over the Bedford Falls set by enormous systems of fans. Even though the pure and beneficent version of America presented in the movie never really existed, pulling back the curtain like this makes it a little harder to pretend that maybe it did. How the Grinch Stole Christmas! is a stone-cold Christmas classic. It debuted in 1966 in a succession of other iconic Christmas specials, following Rudolph the Red-Nosed Reindeer in 1964 and A Charlie Brown Christmas, each of which are beloved by millions and which still air every year over 50 years later. Think of all the classic elements: Max, Cindy Lou Who, the roast beast, and the song. The song! You know you were humming it as soon as you saw the word "Grinch." It's the reason why "your brain is full of spiders, you have garlic in your soul" is a Christmassy phrase apart from it being a thing you mumble under your breath at your racist uncle during particularly tense family dinners. What might be a little harder to remember is that Grinch was an absolute nuclear firestorm of creative talent. But the above photo is a vivid reminder. 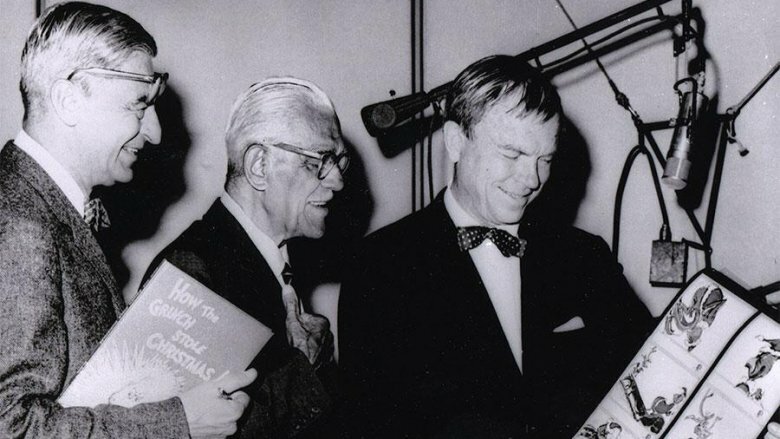 Check it out, from left to right: Ted Geisel, aka Dr. Seuss himself, who wrote both the book the special was based on and the special's screenplay and the lyrics to that iconic song; Boris Karloff, possibly the most iconic horror actor of all time, who provided the narration and the voice of the Grinch; and Chuck Jones, one of the greatest animators who ever lived, responsible for not only this special but also probably whatever pops into your mind when you see the words "Looney Tunes." All that's missing is Thurl Ravenscroft, the voice of Tony the Tiger, who sang the classic theme song. Absolute legends. One of the most memorable aspects of 1990's Home Alone – apart from the grievous violence perpetrated upon the Wet Bandits and the thing where Macaulay Culkin screams with his hands on his face — is the film-within-a-film Angels with Filthy Souls, the source of the eminently quotable line "Keep the change, you filthy animal." (The perhaps more quoted line, "Merry Christmas, you filthy animal" is actually from Angels with Even Filthier Souls in Home Alone 2.) The film clip is so classic and also so authentically made that many people assume that Angels with Filthy Souls is a real movie. As this production photo from Home Alone shows, however, it's not. There's no more to it than what you see Kevin watch. Part of the confusion is that there is a real gangster movie from 1938 called Angels with Dirty Faces that this parody is partly modeled after. But other aspects that help make it convincing are that it was shot on black-and-white negative film and the set was dressed with authentic items from the 1940s. Of course, another major factor is the convincingly period performance given by Ralph Foody as the gangster Johnny in both Home Alone films (further proof that Angels isn't a real 1930s picture is that you can see Foody in decidedly non-1930s films such as Blues Brothers and Curly Sue). So no, Kevin is not watching a real movie in Home Alone that just happens to have the necessary dialogue for him to order a pizza. Keep the changed perspective, you filthy animal. Hey, did you know Die Hard is a Christmas movie? Oh, you did? Well, regardless, the exact second that Thanksgiving dinner is over each year, some very boring and yet still very loud dude is going to be walking around door-to-door in your neighborhood to make sure you know. "Oh, you like A Christmas Story? That's cool I guess, my favorite Christmas film is Die Hard, actually." And then everyone in your family has to go to the hospital for blood loss after cutting themselves on his razor-sharp edginess. Despite the fact that the worst people in the world constantly want you to know that Die Hard takes place at Christmas and thus John McClane is literally exactly the same as George Bailey or actually is even more Christmassy than Santa Claus and is in fact going to walk across broken glass barefoot to bring you presents, Die Hard is actually a good movie with lots of cool stuff in it, including the words "ho ho ho," so here it is on the list. You got what you wanted. 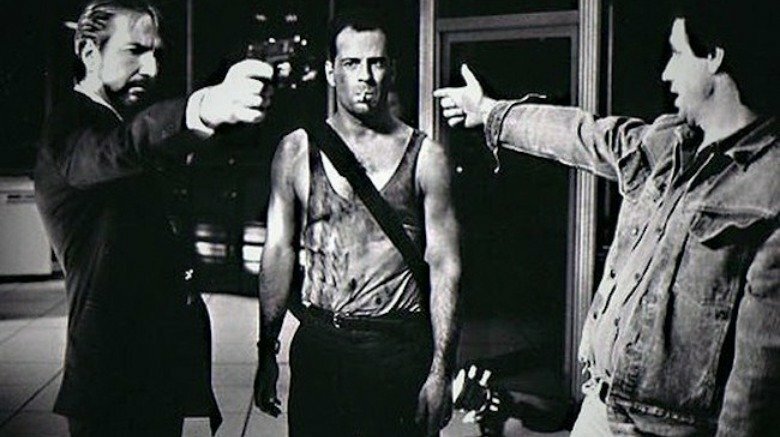 One of the most memorable scenes in the movie is the first meeting between Bruce Willis' John McClane and Alan Rickman's Hans Gruber, in which Gruber pretends to be a hostage in order to turn the tables on McClane, only for the tables to actually be turned on him. 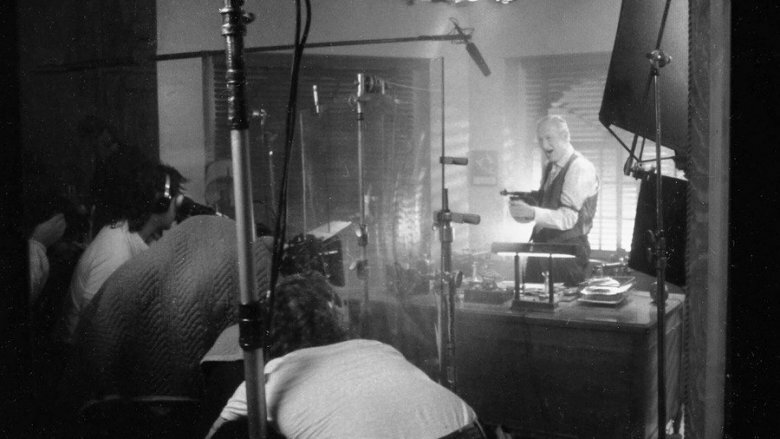 This cool photo shows director John McTiernan instructing Rickman on how to perform the scene using the only gun with fewer bullets than Gruber's: finger guns.